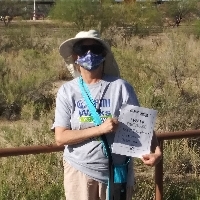 I'm proud to be reviving the Lettes Fight Stigma team and to be walking with NAMI Southern Arizona again. NAMI-SA continues to provide a multitude of unique and vital services here in Tucson and Southern Arizona, despite a drop in public funding. Services continue to be no-cost to participants. The support group I have attended for more than 10 years continues to be important in my life as I live with the mental illness in my son. It is crucially important to support NAMIwalks Southern Arizona, a true treasure in our community. I have just finished the training to be a Family-to-Family teacher and I am looking forward to helping other families. So, please join the team! or just make a donation to me or my team. Hundreds of local families like mine will thank you.